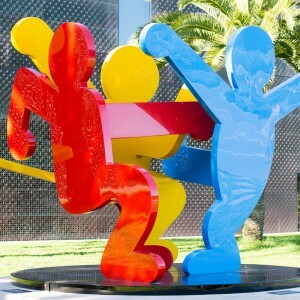 Keith Haring Sculpture on the grounds of the de Young Museum photographed during a visit there with a Guardian Group client. On this website we have tried to describe the help we can offer LGBTI newcomers to the San Francisco area. We haven’t attempted to list all the things which our group of volunteers doesn’t do. We thought people would understand that if an action was on our list, then we didn’t do it! Unfortunately, many LGBTI people throughout the world are desperate. They contact us hoping we can help with some very real, huge, pressing needs, even though the help they are seeking isn’t something we’ve said we do. When we hear of these awful, intense needs, we can only offer encouragement and love. We are not trying to be cruel or selfish, but our group and our church community has limited resources. We have to do what we can and not pretend to have more resources to share than we do. Even our clients frequently ask for more help than we can provide. These requests are the emotionally most difficult. We know and care for the people who are asking for things we cannot provide. It’s tough on them and tough on us. To avoid raising any false hopes, let me explain what our Guardian Group cannot do. We cannot help anyone get into the United States or out of their country into a third-party nation where they can apply to the UN for refugee status. We have no experience and no insight in this process. We suggest exploring what the UN-HCR suggests. We also refer people to the Organization for Refuge Asyluym and Migration (ORAM) . ORAM has helped several people who eventually became our clients get official refugee status and apply to US for entry while they were in in places like Turkey and South Africa. We have no housing for refugees or asylum seekers. We help clients look for housing when they need a place to stay, but we have no shelter to offer ourselves. To be honest, it is very, very, very difficult to find affordable housing in the San Francisco Bay area. Some of our clients have moved every month until they have been able find a job and rent their own space… and then they generally have roommates. We have no jobs or employment to offer. We help our clients find job training. We help them write their resumes and job applications. However, we don’t employ anyone! We do not provide significant financial assistance to our clients. The Guardian Group helps newcomers understand the bureaucratic and social complexities of the United States, California, and the San Francisco area. We provide friendship, advice, and a non-anxious presence. On a practical level, we can help our clients apply for state and city medical coverage, for assistance with food, for disability income, and for general welfare assistance. However, most able-bodied clients will not qualify for public assistance after their initial 8-month refugee resettlement stipend. In addition, publicly-funded programs do not provide a comfortable level of financial security — newcomers are expected to support themselves by working. The Guardian Group was established to provide emotional support and personal guidance on how to navigate American culture. We are not a source for welfare. Our volunteer group and its supporting religious community do not have the money to provide routine financial assistance. We have provided some financial assistance to refugees when they have faced some extraordinary expenses in their first few months in San Francisco. However, we do not have the money to financially assist anyone on an ongoing basis. Our clients need to rely on jobs, education loans, or scholarships for their needs… mostly jobs! This entry was posted in General Comments and tagged asylum seekers, employment, financial assistance, Guardian Group limits, housing, things we cannot do, welfare on January 25, 2016 by Moderator.